Nudge, nudge – off to the adult playground with you! The phrase ‘nudge, nudge‘ used to be synonymous with saucy innuendo. Nowadays, nudge theory (based on an influential book by US economist Richard Thaler) is all about gently persuading people to do what is best for them, from insulating their lofts to taking out pensions to eating more fruit and veg. The UK prime minister, David Cameron, was so impressed by Thaler’s ideas that he decided to set up his own ‘Behavioural Insights Team’, quickly dubbed the ‘nudge unit’. One obvious area for improvement is that of public health, and a good example of nudge theory in action is the increasing provision of adult playgrounds, where gym-style equipment is installed in public parks. The idea is that instead of merely strolling around with your dog, you spend some time jogging on a cross trainer or pushing weights on an arm-strengthening machine as well. Research in the London borough of Camden, which has several such parks, indicates that around 26% of people using them had never exercised before, so for them it was definitely a nudge in the right direction. Until recently, few people felt the need for the term wellness, which really means nothing more than ‘good health’, but nowadays that term underpins an enormous industry of dietary supplements and alternative therapies of varying degrees of plausibility. It is pleasing to see the term reclaimed for the people, in the eco wellness zone set up in the city of Hull. A free adult playground, the ‘eco’ part comes from the fact that after dark it is the exertions of its users that generates the electricity necessary to light up the equipment. If the adult gym does not appeal, there are other free outdoor pursuits to consider. 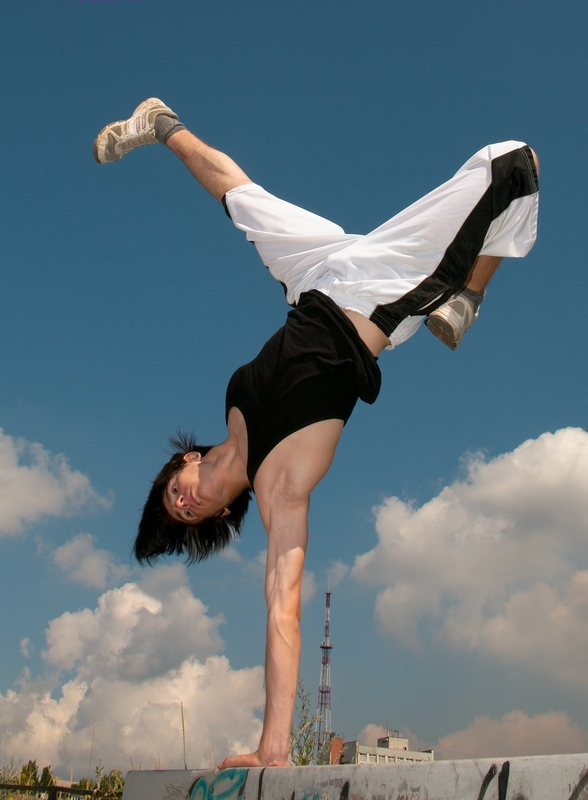 For the fit and fearless, freerunning or parkour is a creative mixture of running and gymnastics where participants leap, spin, jump and climb over or around any obstacles in their path, often performing jaw-dropping acrobatic feats. Many freerunners, or traceurs as they are more formally known, describe a philosophical element to their sport, in which they aim to apply the concentration, inventiveness and ability they use to overcome physical obstacles in overcoming the obstacles of everyday life as well. Also not for the faint-hearted, urban exploration involves secret visits to man-made structures that can range from deserted buildings to cranes, bridges, abandoned ships and even sewers. Urban explorers, or urbexers as they are sometimes known, delight in gaining access to sites that are not open to the public. Many of them specialize in photographing these unusual places or are interested in providing historical records of them. In addition to the potential physical dangers present in derelict or unknown locations, they may also face legal consequences if caught trespassing. For those looking for gentler forms of exercise, but still wishing to try something new, one of the ever-growing number of permutations of pilates or yoga may fit the bill. Combinations of pilates and another sport include boxilates, spinlates (‘Spinning®’ is a form of exercise using static bikes), and poolates (performed in a swimming pool). Fans of Bob Marley may like to try reggaelates, while qilates incorporates meditation and aims to improve your qi (the Chinese word, sometimes spelled chi, that denotes a life force, or flow of energy). Hot yoga (also called Bikram yoga) has several celebrity devotees. Elle Macpherson, Daniel Craig, and Andy Murray are all apparently happy to subject themselves to sweaty stretching sessions in rooms heated to 43° for the additional flexibility that results. At the more wacky end of the scale, you could try laughter yoga, which combines simulated laughter with yogic breathing, leading to an energizing increase in oxygen levels. But for die-hard exercise-phobes, for whom no nudge will be strong enough, perhaps doga (yoga for dogs) would be the thing – even if they are not fit themselves, at least their canine friends will be.